Legendary U.S. Marine Colonel Lewis 'Chesty' Puller proved himself on the world’s most difficult battlefields. Crouched in their foxholes along Edson’s Ridge on Guadalcanal in the Solomon Islands, the Marines formed a critical but thin defense line between strategic Henderson Field and seasoned Japanese infantry lurking in the jungle. It was a miserable place to be. Heavy rains had swept the big island for several days, and the young Leathernecks—most of them unschooled in combat—knew that trouble was coming. The airfield was vital to both the Americans and the Japanese. October 24, 1942, was a busy day for the 1st Battalion as the men deepened their soggy foxholes, carefully arranged mortars and machine guns, filled sandbags, and carried ammunition. Overseeing their efforts was a barrel-chested lieutenant colonel with a craggy face and high forehead who chewed on a cigar and spouted a mixture of encouragement and profanity. Around his neck was an Episcopal Church crusader’s cross, and in one of his battle-fatigue pockets a dog-eared copy of Julius Caesar’s Gallic Wars. His name was Lewis Burwell Puller, a Virginian, and a much-decorated legend in the U.S. Marine Corps. He was blunt spoken and did not mince his words. He walked with a belligerent thrust to his square jaw, and his chest was thrown out like a bantam rooster’s. He was known as “Chesty” by everyone in the Corps. He was respected by all; he was a soldier’s soldier who would stand firm when the going got rough. He was noisily loyal to the service, and had contempt for weakness in men, demanding only the best from his men, and they knew they could count on him. Up and down the 2,500-yard sector manned by his understrength battalion, Puller walked the line. He checked every gun position and ordered improvements. He, too, knew that everything was too quiet and that it would not last. Chesty ordered his men to string barbed wire from the trees, hung with tin cans full of stones and hand grenades with their pins half pulled. This would provide a warning when the enemy started moving. Chesty replaced the receiver and glanced at his watch. It was 10 pm. Suddenly, there came yells from the right flank: “Blood for the emperor! Marine, you die!” Chesty immediately ordered, “Commence firing!” The front exploded in a din of small-arms fire and artillery shells roaring through the rainstorm, and blasts in the black jungle halted Japanese columns. But the enemy spearhead stormed the wire along a narrow front, and their grenades blew holes in the Marines’ crude fencing. The enemy troops ran into murderous fire from Puller’s carefully interlocked machine guns, and hundreds were mowed down. Chesty stalked up and down the line, encouraging and directing his men as the Japanese smashed again at the 1st Battalion. With fanatical courage, the enemy infantry was trying to compensate for the tactical failings of its officers. By about 3 in the morning, after constant fire and eight enemy assaults, Puller estimated that his battalion was down to about 500 men. They were holding on, but Chesty asked regimental headquarters for help. Fresh troops of the Army’s 164th Infantry Regiment were guided by a Navy chaplain to Puller’s line, and he was glad to see them. The harried Leathernecks had no time to greet the “doggies” with the usual derision. For the inexperienced GIs, under pouring rain and in the midst of a howling Japanese attack, it was a fearsome baptism of fire. But the soldiers, often fighting shoulder to shoulder with the Marines, helped to push back wave after wave of enemy troops. A 75-yard wedge in Puller’s line was straightened with the aid of mortars as daylight approached. The weary Leathernecks and soldiers began to breathe more easily as the Japanese onslaught waned and the invaders who had not been cut down by Puller’s machine gunners retreated into the jungle. Stray enemy soldiers were shot or taken prisoner, and Chesty’s men straightened their line, tended to their wounded and the smoking weapons, and counted bodies. During the morning of October 25, the Americans found 250 Japanese dead inside the lines, 25 of them officers. Altogether, a burial detail tallied and buried 1,462 enemy bodies. Puller’s casualties during that momentous night amounted to 19 dead, 30 wounded, and 12 missing. The battalion and its company commanders were commended, and Chesty won a second gold star for his Navy Cross. One of his sergeants, “Manila John” Basilone, was awarded the Medal of Honor. He was the first enlisted Marine to win the nation’s highest decoration in World War II. Young Lewis entered the time-honored Virginia Military Institute. While a “rat” there in 1917, he recalled later, “the Army took all our rifles. I figured if they needed our rifles, they needed me.” So he dropped out at the end of his freshman year to enlist in the Marine Corps in August 1918, because he could gain a commission at the age of 20. “I want to go where the guns are,” he said simply. He was appointed a second lieutenant in the Marine Reserve in June 1919 but, because of the reduction of the Corps after World War I, he was placed on inactive duty that same month. It was a bitter disappointment for the tough young Virginian. However, Chesty was determined. So he again joined the Marine Corps as an enlisted man. He had heard about jungle fighting going on in Haiti so volunteered for service there. He soldiered in the Gendarmerie d’Haiti, a military force set up under a treaty with the United States. 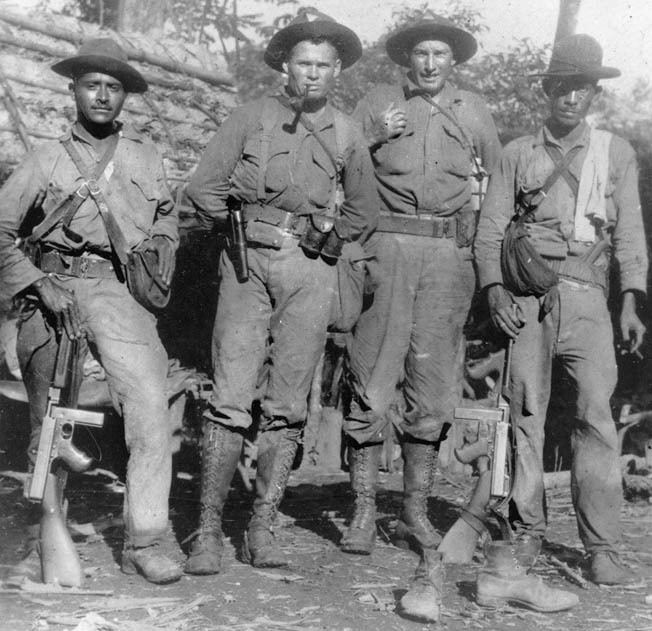 Most of its officers were U.S. Marines, while the enlisted men were Haitians. As both a Marine corporal and a first lieutenant in the Gendarmerie, he saw plenty of action while battling revolutionaries in the tangled, steaming jungles of the Caribbean island. He took part in 40 engagements during his five-year hitch and was awarded the Haitian Military Medal. 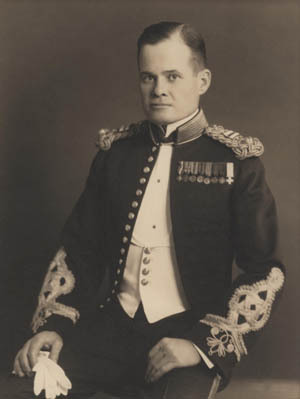 Returning to the United States in 1924, Puller was again commissioned in the Marine Corps. After service at the Marine Barracks in Norfolk, Va.; completing the Basic School at Philadelphia; and serving with the 10th Marine Regiment at Quantico, Virginia, he shipped out in July 1926 for a two-year tour of duty at the Marine Barracks at Pearl Harbor, Hawaii. He took charge of the rifle range but soon became bored and asked for a transfer to Nicaragua, where the bandit leader Sandino was stirring up trouble. Puller shipped out from San Diego, Calif., to Nicaragua in December 1928, and signed up as a captain in the Nicaraguan National Guard. He led units in 60 battles against insurgents and was awarded the Navy Cross for gallantry and leadership. Then it was back to the United States to take the company officers’ course in the Army Infantry School at Fort Benning, Georgia. He was an expert rifle shot and drillmaster and showed dash and sound judgment, though he would later admit that he learned more about the art of war as a youngster while hunting in the woods around his hometown than in any military school. He was a stickler for smartness and believed that the best soldiers are disciplined soldiers. Yet, he sometimes could not resist upsetting established order. Once while engaged in a field maneuver against a horse-cavalry regiment at Fort Benning, Puller abandoned the tactics he was supposed to be learning and won the encounter by stampeding the horses with a tank. Another stint in Nicaragua in the summer of 1932 brought him his second Navy Cross, and the following January he sailed from San Francisco to join the Marine detachment at the U.S. Legation in Peiping, China. He commanded the famed Horse Marines there, after which he went to sea to lead the Marine detachment aboard the cruiser USS Augusta of the Asiatic Fleet. After spending three years as an instructor at the Philadelphia Basic School and another year aboard the Augusta, Chesty joined the 4th Marine Regiment at Shanghai, China, in May 1940. He served as a battalion executive and commanding officer until returning home in August 1941. That September he was given command of the 1st Battalion of the 7th Regiment, 1st Marine “Old Breed” Division, at Camp Lejeune, NC. The regiment was detached in March 1942 and headed for the Pacific Theater the following month as part of the 3rd Marine Brigade. In September 1942, the 7th Regiment rejoined the 1st Division, which had invaded Guadalcanal and Tulagi in the Solomons on August 7, in America’s first offensive of World War II. 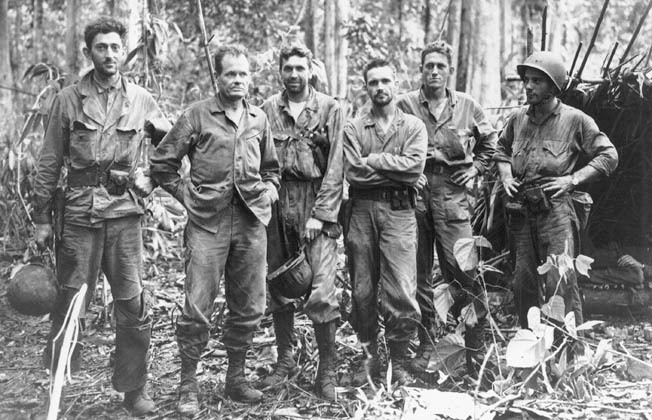 After Army Maj. Gen. Alexander M. Patch’s Americal Division relieved the Leathernecks on Guadalcanal, Puller became executive officer of the 7th Marine Regiment. In that capacity, he took part in the invasion of Cape Gloucester, New Britain. The 1st Marine Division landed there on December 26, 1943, secured a beachhead, and captured two airfields in hard fighting. When the commanders of two battalions were wounded, Chesty took over their units and moved through heavy machine-gun and mortar fire to reorganize them. He led them in capturing a strongly fortified enemy position and collected his fourth Navy Cross. More than a thousand Japanese defenders were killed in the Cape Gloucester campaign, which ended on January 16, 1944, when a final enemy counterattack was destroyed. At 8:32 am on September 15, 1944, the 28,484 men of the reinforced 1st Marine Division started landing on the western beaches of Peleliu, and Chesty Puller’s regiment landed on the left flank to attack the Umurbrogol ridges north of the island’s airfield. It would take four days to seize the airfield. Puller also had misgivings about the operation: The enemy was too well prepared, and the Americans had too few men in reserve. Eight Medals of Honor were earned during the two-month campaign, six of them awarded to Leathernecks who covered grenades with their bodies in order to save their comrades. The Peleliu action, which ended on November 25, cost the 1st Marine Division 1,124 killed, 5,024 wounded, and 117 missing. The total American losses were 1,794 dead and 7,800 wounded, a 40 percent casualty rate. The enemy losses were estimated at 10,200 killed and 302 taken prisoner. The war ended for Chesty Puller in November 1944, when he was named executive officer of a training regiment at Camp Lejeune. He took command early in 1945. He was disappointed at being out of the shooting war, but applied the fruits of his long career to training Marine recruits. Colonel Puller’s fighting days were not over, however. The Korean War broke out on June 25, 1950, and after completing various Stateside assignments, he went to Camp Pendleton, Calif., that August to take over the 1st Marine Regiment, the unit he had gallantly led at Cape Gloucester and Peleliu. North Korean forces had driven ill-equipped and poorly trained U.S. Army units into the southeastern corner of the Korean peninsula, and the situation was desperate. But help was soon on the way in the form of the 1st Marine Provisional Brigade; the British Commonwealth Brigade; and units from France, Greece, Turkey, and several other countries. Pushing Forward With ‘All Speed’… Into a Trap? When General Douglas MacArthur, the U.N. commander-in-chief, conceived his brilliant amphibious invasion of the port of Inchon behind the Communist lines on the western Korean coast, there was a role for Chesty Puller and his regiment. They stormed ashore on the morning of September 15, 1950, in a classic textbook operation, captured Inchon, and pushed 20 miles inland to take Seoul, the ancient capital. After a stiff fight with heavy casualties, Puller’s regiment battled block by block to regain the city from the Communists. MacArthur pinned the Silver Star on Chesty in recognition of his aggressive, heroic leadership. The tide turned, and the U.N. forces advanced northward. On October 24, MacArthur ordered all of his commanders to push forward with “all speed” toward the Manchurian border, unaware that at least 180,000 Communist Chinese troops had slipped into North Korea and were waiting. Lieutenant General Walton Walker’s Eighth Army and Maj. Gen. Edward Almond’s X Corps—including the 1st Marine Division—advanced up the west and east coasts, respectively. They headed straight into a trap. Major General Oliver Prince Smith’s 26,000-man Marine division pushed from the port city of Hungnam to Yudam-ni on the western tip of the Chosin Reservoir, a major source of power for Manchuria. After reaching the “Frozen Chosin,” the Leathernecks were to push on to the Yalu River. The Communist hammer fell on November 2-7, 1950, as the Marines approached the reservoir. Snow fell, and the temperatures slipped below zero as the well-trained, stealthy, and mobile Chinese forces attacked. The Eighth Army was sent reeling back, and Almond’s X Corps was out on a limb. The 1st Marine Division, with four attached Army battalions, was strung out farthest at the Chosin, surrounded by elements of 11 Chinese divisions and threatened with piecemeal destruction. After managing to regroup, the Marine division was forced to begin its “advance to the rear” in what Newsweek magazine called “America’s worst licking since Pearl Harbor.” It would be a fighting retreat. Puller told his men, “We’ll suffer heavy losses. The enemy greatly outnumbers us. They’ve blown the bridges and blocked the roads, but we’ll make it somehow.” The first retreat in Marine Corps’ history began for Chesty and his regiment at 7 am on December 6, 1950, when they headed out for their running fight to the sea. They were accompanied by attached U.S. and Korean Army units and 235 Royal Marine Commandos. The long column wound southward down an icy, one-lane road through the frozen mountains, repulsing constant Chinese attacks from the front, both sides, and the rear. Marine rifles, mortars, machine guns, and howitzers kept up a deadly fire, and supporting Marine F4U Corsair fighters swooped overhead, blasting the enemy with bombs, rockets, and napalm. The bearded, hollow-eyed Leathernecks, who had slept little for a week, subsisted on frozen C rations as they marched southward beside their crawling trucks and jeeps. Everyone walked except the seriously wounded. Eventually they reached Hagaru, halfway on the journey to the port of Hungnam, where the main groups of the division would be united. The worst was over. At Hagaru, the Marines ate welcome hot food and got some sleep, and more than 4,300 wounded and frostbite casualties were treated and flown out to rear hospitals in C-47s. At Koto-ri, six miles south of Hagaru, on the night of December 8, bulldozers pushed 117 dead Leathernecks, soldiers, and Royal Marines into a mass grave. The column marched on from Hagaru, now accompanied by the division’s tanks and supported every daylight hour by U.S. fighter-bombers. Chesty Puller’s regiment acted as the rear guard and repelled two fierce enemy assaults. Finally, after five hard days and nights, the division reached the defense perimeter of the Hamhung-Hungnam port area by 9 pm on December 11, 1950. Exhausted, shivering, filthy, and hungry, the Marines and their attached comrades had lost a third of their complement to enemy action and weather, but they had brought all of their weapons and equipment with them. For his part in the breakout, Puller was awarded the Army’s Distinguished Service Cross and his fifth Navy Cross. He was promoted to brigadier general and named assistant commander of the 1st Marine Division. After further duty at Camp Pendleton, Coronado, California, and Camp Lejeune, and being promoted to major general, he became seriously ill in August 1954. He entered the Camp Lejeune hospital a year later and was retired on the temporary disability list with the rank of lieutenant general on November 1, 1955. And the Corps never forgot Chesty Puller. Its bulldog mascot at the Marine Barracks in Washington, DC, was named Chesty. He wore sergeant’s stripes because, while Puller loved all Marines, his favorites were the sergeants. The old soldier finally gave up the fight and died at the age of 73 on October 11, 1971, at the Veterans Administration Hospital in Hampton, Virginia. They buried him at high noon on a crisp fall day in a family plot at Christ’s Church Cemetery in Middlesex County, Virginia. Three rifle volleys rattled out in salute, and the thin notes of taps echoed across the remote churchyard. They were all there, more than 1,500 Marines and former Marines, pink-cheeked recruits from Quantico, and leathery old timers who remembered Chesty’s courage and compassion for his men. The corps commandant was there, and so were 20 generals. Chesty Puller’s medals are on display in the VMI Museum’s Hall of Valor. Besides five Navy Crosses, the Army Distinguished Service Cross, and the Silver Star, Chesty wore two Legions of Merit, two Bronze Stars, the Air Medal, and the Purple Heart. Tags Camp Pendleton, Chosin Reservoir, Distinguished Service Cross, Edson's Ridge, Guadalcanal, Henderson Field, Korean War, medal of honor, Pacific Theater, Pearl Harbor, Philippines, Silver Star, Solomon Islands, United States Marine Corps, Veterans Administration, virginia military institute, West Point military academy.